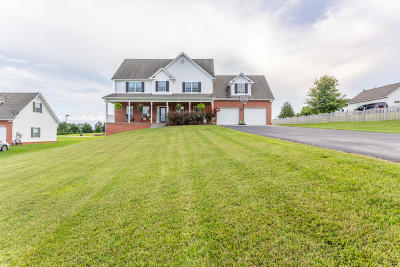 This home is well maintained and move-in ready! Sitting on a full acre lot, this home has over 2,800 square feet and enough space inside and out to play, run and entertain. Enjoy the peacefulness of Cohl's Landing, an upscale community with mountain views. Features include a spacious main level floor plan, 9 ft. ceilings, recently added insulation, fresh interior paint, bright open eat-in kitchen w/ pretty tile backsplash, raised ceiling, huge garage w/ room for storage/work area, relaxing front porch, brand new HVAC unit, 12 x 16 backyard storage shed, wonderful mountain views and an enormous flat backyard.